Our product range includes a wide range of fluid micro concrete. We are leading Manufacturer of Fluid Micro Concrete with the Brand name of PERMA. 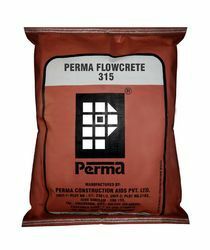 Perma Flowcrete is a cementitious grey powder with micro fine aggregates which allows reconcreting of the damaged, dilapidated structures. The product needs only addition of Water to form a free flowing concrete with enormous Initial and final strengths. Perma Flowcrete is useful to reconstruct parts of beams and columns with far superior strength and with very high speed. Grouting structural cut outs and recess in sanitary fittings like floor traps, annular spaces of pipe passes through walls etc., in residential buildings. Mix Perma Flowcrete with water in the ratio of 3.5 litres to 4 litres of water to every 25 kgs. sack of material to get a uniform free flowing mortar. Pour this mortar in the rigidly fixed forms. Care should be taken to see that the contact surfaces are dampened before fixing the form. Shutter forms should be effectively sealed to avoid uncontrolled leakages. If the repaired surface needs re-plastering then hack the surface immediately after removal of shutters. Perma Flowcrete is available in 25 kg and 50 kg HDPE sack. Looking for Micro Concrete ?